Last month, Flagler County’s Fun Coast Down Syndrome Association (FCDSA) held a dinner fundraiser for their Camp I Can Enrichment Center located at Palm Coast Praise Church in Bunnell. Camp I Can is a monthly educational camp for individuals with Down syndrome ages 3 months and up. Free to members of FCDSA, non-members pay a monthly tuition. Pre-school-age learners work on pre-reading and pre-math skills. Teens and adults can work on reading and math skills that they may have trouble recalling. There are also social opportunities such as dance classes, movie nights, and game nights. The dinner event featured lasagna created with the marvelous assistance of the chef of the Palm Coast Carrabba’s Restaurant. Members of FCDSA chefs-in-training were directed by the Carrabba’s chef each step of the way. They also plated Caesar salad and focaccia bread to accompany the lasagna. Store-bought cupcakes, cookies, and cakes lined the dessert table. Take-out was available to anyone wishing to eat dinner later. Another opportunity for FCDSA members to cook up something delectable will be on May 18, at their Baked Ziti Dinner. 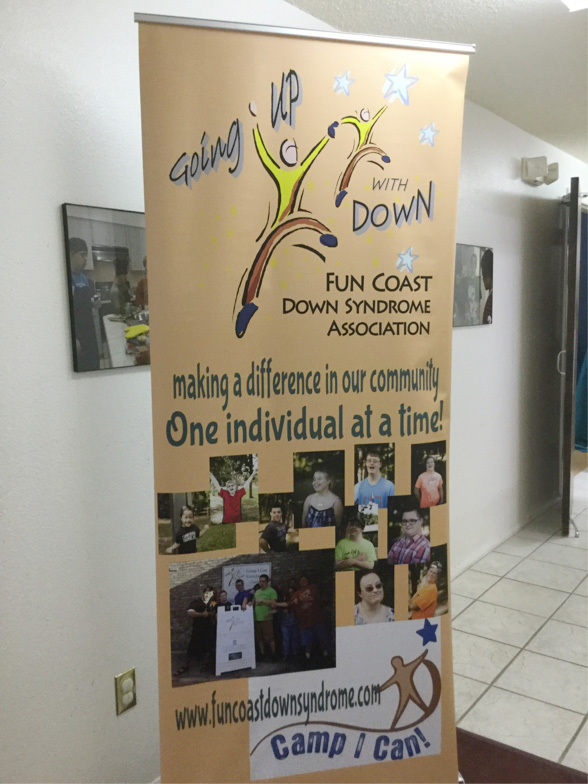 Fun Coast Down Syndrome Association has also begun building community teams for their primary fundraiser, the Buddy Walk, in Palm Coast on March 23, 2019. FCDSA’s Camp I Can banner welcomed everyone to the dinner fundraiser. 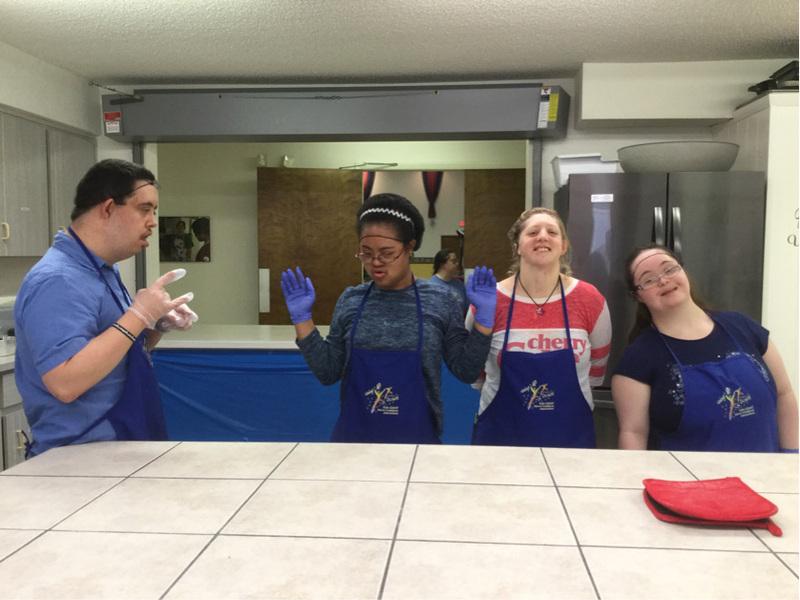 FCDSA chefs-in-training were excited to prepare the meal. 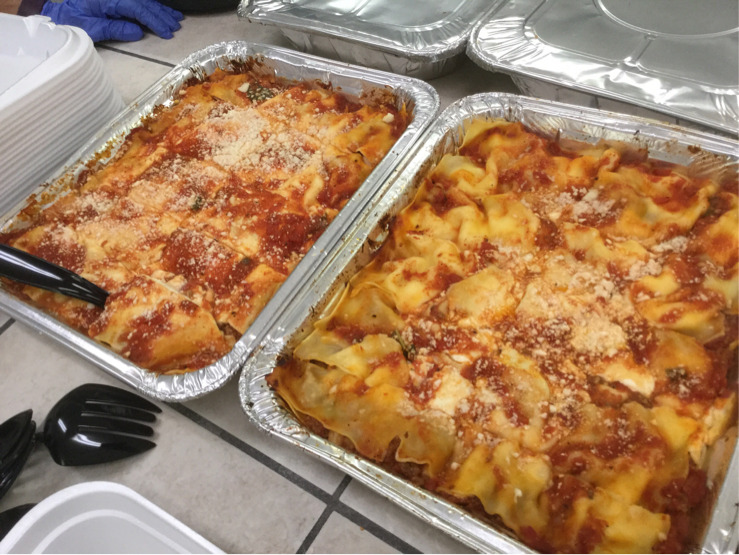 The delicious lasagnas were prepared by FCDSA members under the guidance of the chef of the Palm Coast Carrabba’s Restaurant.